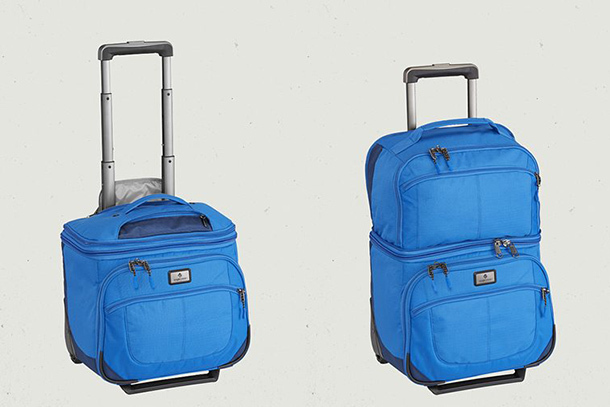 Two bags in one, the EC Adventure Pop Top Carry-On converts with a few zips from an under-seat wheeled tote to a larger, overhead bin carry-on. Pros: With two main compartments and a series of smaller mesh and zippered pockets, organization and quick access is built in. It’s easy to convert from an underseat wheeled tote to a larger carry-on, and it has a back-slip panel so it can be stacked onto a wheeled suitcase. The wheel placement makes the bag virtually unflippable while it’s rolling, a quality I tested extensively on the broken sidewalks of Boston. The lower external pocket has an organizer built in, making it a true carry-on alternative to a purse or man bag. And at 5 pounds 11 ounces, it’s fairly lightweight. Usefulness: 9/10 Baggage that does double-duty and can be easily converted over the course of a trip offers travelers a ton of useful flexibility. Value: 8/10. Pricier than base-model luggage, this bag delivers solid value with its sturdy construction and innovative design. Durability: 9/10. All of the moving parts on this bag feel up to the task of heavy use. And Eagle Creek’s No Matter What Warranty covers repair and replacement for damage. Cool Factor: 9/10. This isn’t a button-down bag; it’s got a breezy, slightly outdoorsy look that will appeal to travelers attempting to free themselves from the anonymity of the common suitcase. Final Verdict: This is a good bag for general use, and it’s a great bag for apartment dwellers looking to maximize luggage versatility with a minimum number of suitcases; business travelers who want a rolling tote for conferences or meetings; and shoppers who always seem to need additional room for new purchases when traveling home.